1. Give clutter the boot. 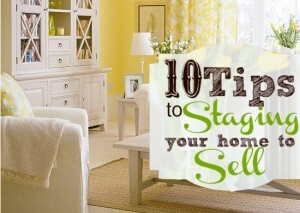 Prepare your home to sell by ridding it of the clutter. Too much furniture is one of the major contributors to a cluttered look. Give it away, sell it or store it. 2. Group the furniture, making cozy user-friendly conversation groups. Keep furniture away from walls, floating it within the room and actually opening up the space to appear larger. 3. Move your furniture around. A small table, formerly holding a lamp, can be turned into a pretty writing desk or book table. 4. Re-purpose a room. Any room that is gathering junk can be turned into a different room. Hang drapery or fabric in the basement, and a yoga room is born. 5. Light it up. Increase the wattage in lamps to make your home warm and inviting. A rule-of-thumb is 100 watts per 50 square feet, making sure you have ambient lighting, task lighting and accent lighting. 6. Paint it to make it larger. Paint walls the same color as the drapes to make the room seem larger. Adjoining rooms should be the same color, making both seem to be one space. 7. Paint the room a neutral color in a warm hue. 8. Experiment with the paint colors in the dining room, powder room or bedroom. A deep tone on an accent wall adds unique drama. 9. Show your art in its best light by varying the grouping instead of hanging it in a straight line. 10. Group your accessories and artwork in groups of three, an arrangement more pleasing to the eye. By highlighting the positives of your home in the above mentioned ways, you can minimize the time your home is listed for sale. If you have questions about staging your Gulfport home, please feel free to give us a call at 228-275-7500.